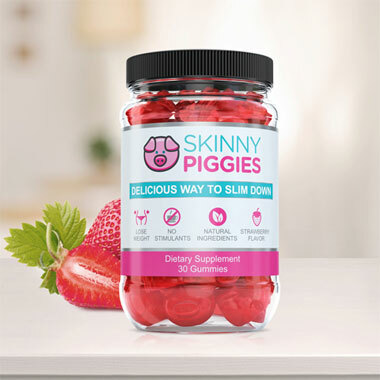 Skinny Piggies are delicious supplement gummies formulated to help you reach your weight loss goals quickly and safely. Take one Skinny Piggy with a full glass of water 30 minutes before your meal. You’ll notice you are getting full quicker and eating smaller meals. You’ll feel full and satisfied longer and consume fewer calories per day. Click here to see our explainer video. Everyone is different. To lose weight, you must achieve negative calorie balance. That means that you need to be burning off more calories than you're consuming. Skinny Piggies will help you do that by making you feel less hungry so that you eat fever calories per day. You should set a reasonable weight loss goal for yourself. A good goal to aim for is between 1 to 4 pounds lost per week. Evidence shows that people who lose weight gradually and steadily are more successful at keeping the weight off. 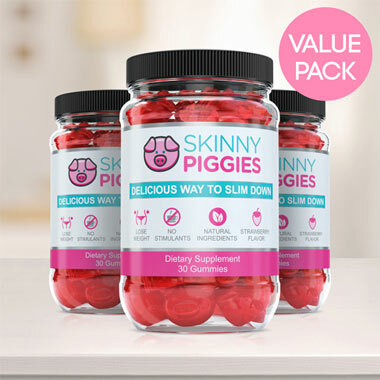 Skinny Piggies are made from natural and safe ingredients: agar-agar, collagen, gelatin, biotin and Inositol. Please take a look at the list of ingredients with details. Start taking one Piggy once a day before your dinner. Over the period of one week you can gradually increase to up to 3 times per day. Doctor Donald Hensrud, M.D at the Mayo Clinic states that cutting calories is a far more effective way of losing weight than exercising. The key is to consume fewer calories than you burn. 3,500 calories equal to about 1 pound of fat. Cut 500 calories a day by eating smaller meals and you will lose a pound of fat in a week. Although you can lose weight just by eating less, moderate exercise should be a part of everyone's healthy lifestyle and may help speed up your results. Can men take Skinny Piggies? Absolutely! Our formula is equally effective for both men and women. I have a medical condition. 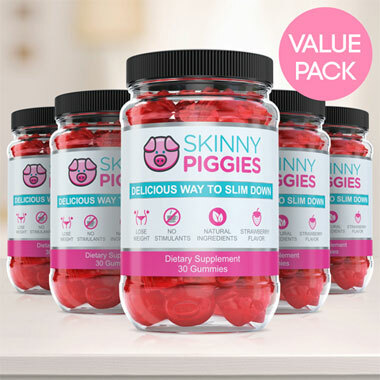 Can I still take Skinny Piggies? We do not recommend taking Skinny Piggies if you have a medical condition. Please consult your doctor. There are no known side effects to the ingredients. Please review the ingredients to ensure you do not consume ingredients you may be sensitive or allergic to. Can I take Skinny Piggies while I’m breastfeeding or pregnant? If you are pregnant you should not take any weight loss supplements. When breastfeeding please speak to your healthcare professional to get an approval before you take Skinny Piggies. Orders shipped same day when placed before 3pm EST and within 24 business hours when placed after 3 pm EST. (Monday-Friday excluding holidays). How long does the shipping take within the US? We'll ship your order by USPS Priority mail from Toledo, Ohio. It normally takes 1 to 3 business days to deliver your package to a domestic U.S. address. When you place an order, you will receive a tracking number by email. How long does the shipping take to outside of the US? International shipping normally takes 7 to 10 days. However, occasionally there may be a delay in the customs clearance that can cause a delivery delay. When you place an order, you will receive a tracking number by email.